+ Like I mentioned above, we are adjusting to a new schedule. The husband started at a new department (he’s a police officer for those new around here) and it’s actually going better than I expected. He has a longer drive and the hours are way different then before but we’re slowly finding our groove. I thought I was going to really struggle with this new routine because 1.) I don’t really like change and 2.) I rely on him so much. I don’t have many friends around here so it can be a bit lonely, but it’s given me more time to focus on my design work and for that, I’m really excited! + My little Bosco is starting to worry me a little. I know he’s an old man (15!) but it still breaks my heart. I mean overall he seems and looks pretty healthy, but it’s little things. It’s been a year since he had eye surgery to remove a cancerous tumor and I’m so thankful it didn’t spread, but now we’re dealing with arthritis, some weight loss, eye/hearing issues and possible kidney disease. We go to the vets again this week for more tests but our vet definitely suspects an issue with his kidneys. Prayers and positives vibes are much appreciated. + On a lighter note, I’ve already started listening to Christmas music…. while designing a Thanksgiving art printable. haha I blame the Hallmark channel because they started with their Christmas movies! I’m not wishing the Fall/Thanksgiving season away, but I am pretty excited for Christmas. For the first time in 3 years we’re not going anywhere! Don’t get me wrong, I love being around family, but I’m really looking forward to staying in our little home, just the 3 of us! + If you ever wanted to know how they come up with all those Jeopardy questions. + Beware! 5 of the most haunted towns in America. + I’m ready for crockpot everything, starting with this honey teriyaki chicken. + And after that recipe, I want to try this creamy chicken chili. + And for dessert, these apple pie oatmeal crumb bars look delicious. + Tips & top tools for Holiday cookie baking success! + I'm pretty terrible at doing my own hair, but I really want to try this cute look. + Need to find a cozy sweater like this. + Pretty up your phone or desktop with these FREE fall wallpapers. + Our fun filled Fall weekend. + Did a little window shopping. + 10 random facts about me! + Why I decided to rebrand. Oh sweet girl, I'm sending love your way for little Bosco! My heart broke a little just reading that paragraph. I swear dogs are so much like kids it's hard not to worry yourself to death over every little thing (I do it, too, with our dog), but hopefully everything will be okay with him! 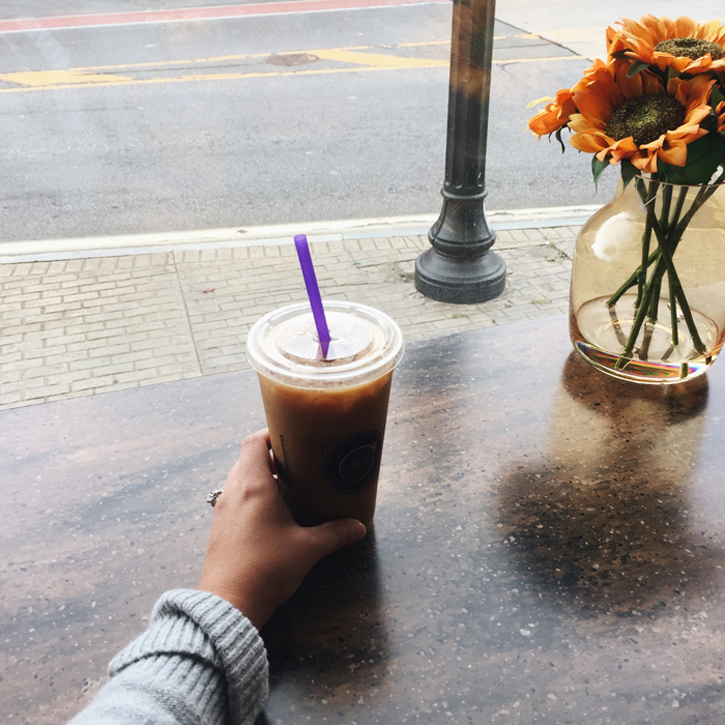 A coffee pick me up sounds good right about now! I feel like Hallmark jumped the gun a bit on their movies. Not to say I am not watching the Christmas ones, because I totally am, but they could have done something with Halloween and more fall ones and Thanksgiving instead of hitting Christmas BEFORE Halloween! Yay for virtual coffee dates! I totally get you. I don't like change much either. I don't know how you'd feel about this, but the joint vitamin I take has worked on animals. My friends give it to their dogs and have said it makes a difference for them. It's weird, I know, but let me know if you want to try it for your pup! I totally LOLed at "listening to Christmas music…. while designing a Thanksgiving art printable" hahah! Nothing wrong with that. I started burning my Christmas scent candles last week so you're not alone. Sometimes staying home for the holidays is much-needed. There are days where I just want to come home and have the whole apartment to myself and not talk to anyone or see anyone. I like your window shopping post, love! What a great idea to name "collage" posts! Oh Bosco! I hope the lab results come back ok. Thinking of you and Bosco.